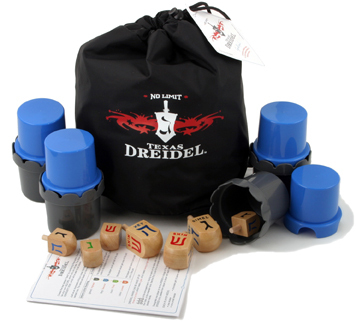 FAQ About No Limit Texas Dreidel™ - Experience Dreidel in a whole new way. Q: What is No Limit Texas Dreidel? A: No Limit Texas Dreidel combines the traditional dreidel game with Texas Hold'em poker. The objective is for each player to create the best dreidel "hand" by combining dreidel spins. You will combine dreidel "spins" in your shaker, which only you will see, with other Community Spins, which will be seen by all players. Players bet in rounds using poker betting rules. The game is best played with chocolate gelt (coins), as is the traditional wager for the Dreidel Game. 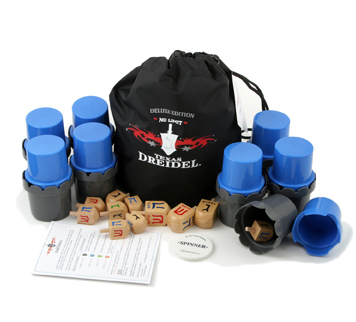 No Limit Texas Dreidel is an entertaining adult party game and is family fun for everyone ages 9 to 99. By the way, the correct term is "hole cards" and "hole spins" -- not "hold" -- although it should be "hold," yes? Thank you The Jewish Channel and Modern Jewish Mom Meredith Jacobs. Q: What is included in each edition of the game? A: This question comes up from time-to-time, usually by people who've indulged in their winnings (the chocolate coins) before the end of the game. They want to know if the empty foil: sans chocolate, has any betting value. Our answer is definitively: No. Q: What happens if your hole dreidels end up stacked on top of each other after a shake? A: This happens, even with seasoned players. You'll think you had a good shake, peer down into your hole, and find that one small dreidel is stacked on top of the other. In this case it is kosher to re-cover your shaker and shift (not re-shake!) the shaker to sort the dreidels out so they are both flat on the bottom of the shaker. Whatever letters are on top post-shift stick -- even if the letters change. Q: Do I have to know how to play poker to play No Limit Texas Dreidel? A: No. But you will learn much about poker when you play No Limit Texas Dreidel. You will learn about hands and poker betting rules, buttons, betting limits, and bluffing. Poker is a wonderful game that we believe everyone should learn: it has lessons to teach about math, probability, social behavior, and risk-taking. You can begin to learn these lessons too by playing No Limit Texas Dreidel. See, parents, it's educational! Q: Are you trying to replace poker with No Limit Texas Dreidel? A: No way! We are poker players. We sit for hours concentrating intensely on our cards, not saying a word except "I'm all in." No Limit Texas Dreidel is like poker but has a different purpose: it's a social game. You can talk and play NLTD. You can drink and play NLTD. You may even be able to dance and play NLTD (someone try it and report back). The easy-goingness of NLTD is that the stakes are chocolate and there are fewer combinations: there are only four Hebrew letters, mind you. However, people still do get pretty competitive while playing. Q: How can we play NLTD at our Hanukkah Event? A: Here is a page on how to do a Texas Dreidel Tournament.